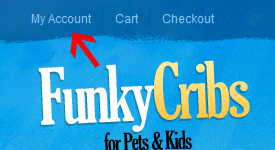 This section is designed to help people navigate and use FunkyCribs.ie with ease. 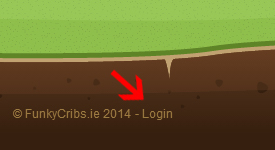 You can create an account with FunkyCribs.ie on the checkout page or if you wish you can click on “My Account” at the top of the page (as shown in the image below) and you can sign up there. And lastly the third way is to sign in whilst you are on the Checkout section of the website. Please note, if you do not see the “logout” link at the bottom of the page you are not currently logged in.